Don’t waste your time repeating experiments. Use the best at every step and get the most out of your efforts. Being scientists ourselves we saw the need for validated reagents, automated sample processing, cell isolation, and cell analysis, to ensure reproducibility and standardization. Our bench top solutions are easy to use and intuitive, allowing novices to generate data with ease and experts to take their research to the next level. Get the most out of flow analysis with tips and tricks for optimizing sample preparation and experimental design. 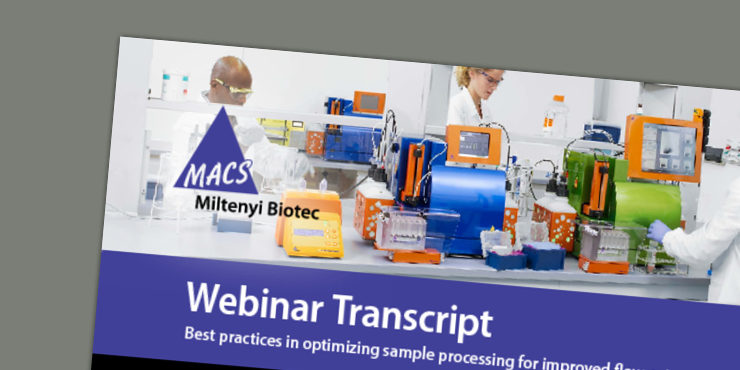 Key topics include increased yield and reproducibility during tissue dissociation, efficient rare cell sorting through pre-enrichment and decreased time spent cleaning and maintaining instruments. Start with gentle sample preparation that won’t hold you back from seeing all your data. The convenience, flexibility, and efficiency offered by gentleMACS™ Dissociators provide the highest-quality starting material for subsequent cell separation, cell culture, and cell analysis experiments. The procedures are flexible and allow for either pre-set or user-defined programs, available for virtually any tissue type while safe guarding both the user and sample in a sterile, closed system. MACS® MicroBeads won’t slow you down or alter your results. As pioneers of magnetic cell separation, we are painfully aware of both the daily experimental challenges as well as the hurdles to bring a technology to the clinic. MACS® Technology combines the use of MACS® Separators, MACS MicroBeads and MACS® Columns to give you versatile cell isolation strategies (positive selection, untouched isolation, or depletion) while ensuring the integrity of your cell samples for your downstream applications. Look beyond purity and recovery, set the stage for translation, and get improved downstream analysis. MACSQuant® Flow Cytometers combine innovation and performance with the highest convenience and ease of use. Powerful and compact, our instruments are designed to ensure that all flow cytometry users, regardless of experience, can perform advanced cell analysis. Make the most of your time by leveraging full automation walk away capabilities. We’re here to share our learnings so you can achieve your goals.